On one of my last visits at Kajitsu in NYC (Kyoto-style shojin kaiseki restaurant), I was so impressed by a simple rice dish the chef put together for me and my friend. 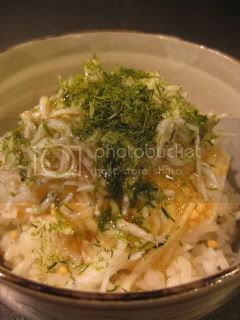 It was basically rice with naga-imo (mountain yam) and arare (tiny rice crackers). Naga-imo was very thinly shredded instead of grated like we normally do. The shredded naga-imo gave a crisp texture and it made a nice texture combination with the tiny rice crackers. So, I was inspired by the dish and made my own rustic version, with my donabe rice (cooked with double-lid donabe rice cooker, "Kamado-san"). I made plain 50/50 brown-white rice with Kamado-san, then topped the rice with some shredded naga-imo (it's also called "yama-imo"), baby rice crackers from Kyoto, some steamed shirasu (baby white fish), shiso leaves, and ao-nori (aromatic seaweed powder). As a seasoning, I made a simple soy-flavored sauce. The ingredients (1/2C dashi stock, 1T mirin, 1T soy sauce 1tsp kuzu-ko or arrow starch) are whisked together in a small pan and put over low heat until heated through and smooth. The sauce was poured lightly over the dish at the end.